Transformer presents Bloodlines, a group exhibition curated by Martina Dodd. Seeking to challenge the societal norms and restraints imposed on the female form, Bloodlines explores the external and internal pressures and pleasures of the body. Drawing from their own personal and collective experiences, artists Lisa Hill, Tsedaye Makonnen, Samera Paz, Iman Person and members of the àjé collective examine the corporeal connectivity of their ancestral histories through works on paper, sculpture and performance. Works featured in Bloodlines tow the line between fascination and repulsion, directly addressing the stigmas associated with a woman's menstrual cycle, while subtly exploring the effects of time on the physical and social body by shifting the meaning and interpretation of selfhood. 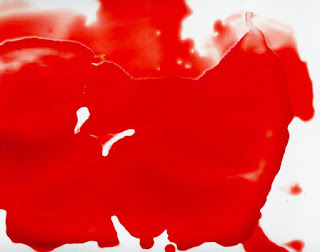 Martina expands; "Through abstract renderings, Paz and Person both use their own menstrual blood as a medium, placing the viewer at the will of the material, while Hill's fragile yet imposing installation also commands attention as she references the invisible inheritance passed down from mother to offspring by reproducing the shedding, scarring and regeneration of skin on handmade paper. Through the exhibition's performance programming Makonnen highlights the intense physicality of birth while the àjé collective's performance explores the narrative ecologies of 'moonblood'." Martina Dodd is a DC-based art historian and curator. Her concept driven shows have touched on topics relating to race, gender and power dynamics. She is intrigued by the ways in which value is placed on art and seeks to examine the social impact material culture has on society. People's Climate Change March in Washington, DC, 20X13 in. Peter Charles, TWISTED COLUMN. steel, 8X72 in. GREEN CHALK CONTEMPORARY ASKS, "NOW WHAT?" OPENING RECEPTION: Thursday, May 25, 2017, 5:00-8:00 pm. PLACE: The Press Club, 1123 Fremont Blvd., Seaside, CA. mixed media on paper, 16X16 in. Hosted by The Press Club, Green Chalk’s latest exhibition poses the question, “Now What?" Artists Peter Charles, Roberto Bocci, Jamie Dagdigian, Susan Hyde Greene, Richard James, Logan Norton, Rhossio Munoz, the Temple Sisters address issues of immediate relevance to a chaotic time in America. This exhibit is at The Press Club, and the show opens on May 25 from 5:00- 8:00 pm with a panel discussion. Themes addressed by artists in the exhibition include the public, private and personal reactions to the new administrations few months, including effects of and on the media, the status of gender, immigration and the environment. Robert Bocci is a fervent believer in the importance of social justice, women’s rights, science, education for everybody and culture. Starting on January 21, he has documented march protests on the streets of Washington DC and most recently, the People’s Climate Change March. He mixes and marches along with the crowds shooting mid-range to close ups of people and signs. The resulting slide show for this exhibition can be considered a travelogue photography essay seeking to recreate the tension and feeling of being enveloped by the protestors and their antiestablishment slogan chants. Peter Charles, known for his elegant and minimal approach to art, distills complex sensations and relationships as he alters, distorts or abstracts an idea to emphasize its essential character. About TWISTED COLUMN, he states, “The twisted column might symbolize a distorted and contorted Washington Monument...A comment on lies and distortions of truth and fact.” Charles recently relocated to San Luis Obispo, CA from Washington, DC. The opening reception happens from 5pm-8pm, with a panel discussion, including audience questions, from 6:30-7:30pm.